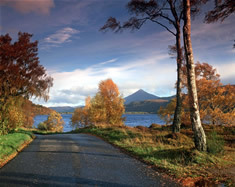 Travelling throughout Scotland by comfort of car gives you the flexibility and freedom to tour the country at your own pace and to your own schedule. The road system is well engineered and maintained, adding to your overall holiday experience. Driving on the Left – In Scotland, as elsewhere in the UK, driving is always on the left-hand side of the road. Remember to stay left and yield right and you will get along just fine. Speed limits – In urban areas, the speed limit is generally 30 miles per hour (mph), which sometimes goes up to 40 mph on dual carriageways (these are four lane roads with 2 lanes going in each direction). On roads outside town, the speed limit rises to 60 mph on normal roads and 70 mph on dual carriageways or motorways. Roundabouts – Roundabouts are a standard feature of the Scottish road system. The rules for using roundabouts here are simple: give way to all vehicles coming from your right and always turn left on entering the roundabout. Single Track Roads – When discovering the many remote areas of Scotland you will more than likely be driving on a single track road. The Scottish Road Safety Campaign has a detailed online leaflet desribing the rules of driving on single track roads. Traffic Scotland – This website provides relevant up to date information to road users on Scotland’s motorway and trunk road network. The purpose is to help drivers make informed choices about the timing, routing and travel mode for current or future journeys.